If your child LOVES Barney like mine then you have got to get the Barney Loves You 3-DVD Set! 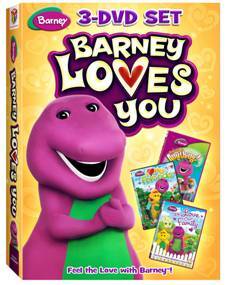 It’s three times the love, laughter, sharing and caring when Barney®: Barney Loves You 3-DVD Set arrived on February 19, 2013 from Lionsgate and HIT Entertainment. Huggable, loveable Barney and his playground friends discover the joys of friendship and family through imagination, song and dance. So come along with everyone’s favorite T-Rex in this heartwarming collection featuring Barney: We Love Our Family, Barney: You Can Be Anything and Barney: I Love My Friends. Win It: (1) Barney Loves You 3-DVD Set to a lucky winner!